For many of you in the U.S. you practically LIVE in the Stop + Shop grocery store they have so much to offer . Now you can add some high quality, inexpensive beauty care basics into your cart next time you're there! Etos is a Dutch beauty brand founded in 1919 now sold in U.S Stop + Shop stores. The line currently has all the basics for your every day beauty routine. The packaging and design are eye catching and modern, and they'll work within your budget. 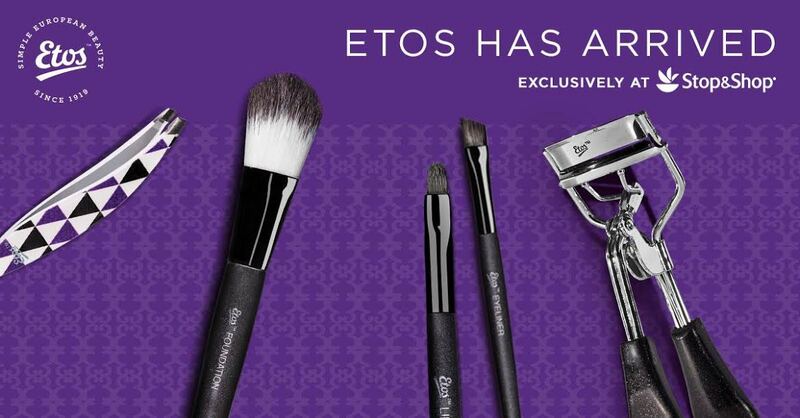 The Etos line includes items like makeup and hair brushes, sponges, nail files, cosmetic bags and bath accessories. Some of the standouts were the Etos Oval Facial Cleansing Sponges, which were great for every day cleansing and for your little ones, the cute Etos Mini Tweezer Duo and the Etos Fashion Nail Files 2 pack (shown, above), complete with their own carrying case (love that! ), in various patterns. The makeup brushes are soft and high quality. The Etos Powder + Bronzer Brush and Etos Dual Ended Brow Brush are definitely two to stock up on as well. *These products was provided courtesy of Etos PR for reviewing purposes.